The 227 Stationary Living Room Group by Smith Brothers at Westrich Furniture & Appliances in the Delphos, Lima, Van Wert, Ottawa, and Celina area. Product availability may vary. Contact us for the most current availability on this product. Arm Type Smith Brothers ensures that all arms are well padded to give your piece that finished look, as well as an extra measure of comfort and softness. Create an inviting yet stylish living space with the 227 collection. This group consists of a sofa, chair, and ottoman. 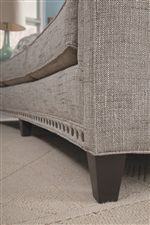 Features include sloping track arms, nail head trim bases, and tapered wood legs. 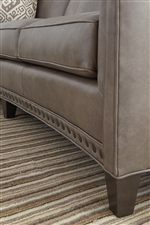 Choose from your choice of fabric or leather, as well as the color of the nail head trim and wood leg finish. This collection is made in the USA, so you know you're getting quality and long-lasting product. The 227 collection is a great option if you are looking for furniture in the Delphos, Lima, Van Wert, Ottawa, and Celina area. Browse other items in the 227 collection from Westrich Furniture & Appliances in the Delphos, Lima, Van Wert, Ottawa, and Celina area.